﻿Published by Sareth Ney on Dec. 1, 2015 at 2:47 a.m.
Photo credit: 3Teeth's Facebook page. ORLANDO, Fla. – Primus and TOOL will make a tour stop at CFEArena, on Jan. 28. It will be part of their co-headlining tour. The direct support will be 3teeth on all tour dates. Les Claypool is the vocalist and bassist, Larry “Ler” LaLonde is the guitarist and Tim “Herb” Alexander is the drummer of Primus. “Primus and the Chocolate Factory” was their most recent album and it was inspired by the soundtrack of the film, “Willy Wonka & the Chocolate Factory”. Two versions of the album have been released. The most recent was released on Nov. 20 and is the 5.1 Surround Sound Edition. To view their rendition of “Candyman”, please click here. To visit Primus’ official website, please click here. To like them on Facebook, please click here. To follow them on Instagram, please click here. To follow them on Twitter, please click here. To subscribe to their channel on YouTube, please click here. Maynard James Keenan is the vocalist, Adam Jones is the guitarist, Justin Chancellor is the bassist and Danny Carey is the drummer of TOOL. Very important person (VIP) tickets are available on their website for TOOLARMY members. 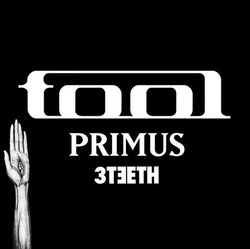 Please click here, to visit TOOL’s official website. To like them on Facebook, please click here. To follow them on Twitter, please click here. Chase Brawner is the guitarist, Xavier Swafford is the keyboardist, Alexis Mincolla is the vocalist and Andrew Means is the drummer and producer of 3TEETH. Their genre of music is industrial, they are from Los Angeles and they are signed to Artoffact Records. They will be on tour promoting their debut album, “Bound By Flesh, Freed By Blood”. The album peaked at number eight on the iTunes Top Electronic Albums chart and the quartet has been a band since 2013. Listen to them on Bandcamp, by clicking here. To like 3teeth on Facebook, please click here. To follow them on Instagram, please click here. To follow them on SoundCloud, please clicking here. To follow them on Twitter, please click here. To subscribe to their channel on Vimeo, please click here. To subscribe to their channel on YouTube, please click here. Jan. 16 - BOK Center, Tulsa, Okla.
Jan. 19 - Landers Center, Southaven, Miss. Jan. 20 - Sprint Center, Kansas City, Mo. Jan. 23 - Bridgestone Arena, Nashville, Tenn.
Jan. 25 - Infinite Energy Center, Duluth, Ga.
Jan. 26 - Bojangles' Coliseum, Charlotte, N.C.
Jan. 28 - CFE Arena, Orlando, Fla.
Jan. 30 – Pensacola Bay Center, Pensacola, Fla.